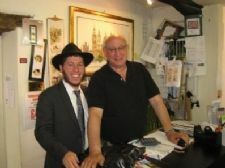 Two student rabbis from the United States - Ahron Blasberg and Yossi Amos – visited Oxfordshire for two weeks to meet unaffiliated Jews living in the area. The two students came as part of the Merkos Shlichus programme where rabbinical students take a break from their studies to travel to farflung Jewish communities throughout the world. 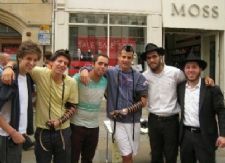 With an influx of five million tourists a year and hordes of summer school students, the rabbinical students had the opportunity to meet people on the busiest street in the centre of Oxford, Cornmarket Street. Two students studying in Oxford for the summer had the opportunity to celebrate their Bar Mitzvah, which they had not celebrated before, with a celebration held at the Oxford Chabad Society Friday night Shabbat dinner with their friends from their summer programme. One place they visited was Burford, ranked sixth in US business magazine Forbes magazine's list of "Europe's Most Idyllic Places To Live", where they were greeted by the Mayor of the town, David Cohen, who runs the town’s two fabric shops. We had an enjoyable conversation and parted with a warm hug, Yossi related. This was the second year running that rabbinical students chose to come to Oxfordshire to visit Jewish people unaffiliated with the Jewish community. Rabbi Eli Brackman, director of Chabad of Oxford, who invited the rabbinical students to visit Oxfordshire, expressed his thanks to them for coming to Oxfordshire and making such a positive difference on so many lives in such a short period. He looks forward to hosting rabbinical students again next year to build on their success.